Stunning is the best word to describe Vue De Monde, one of Melbourne's, and indeed Australia's finest and most exclusive restaurants. The view (it sits on the 55th floor of formerly Melbourne's tallest building, The Rialto Towers), the service, the food, the wine, all simply amazing. Of course you pay for it, and how, but you get what you pay for, as the old adage goes, and here is yet further proof. Everyday folk must save up to afford the prodigious price tag, but if you have a very special occasion, it's worth every last penny. Just make sure you book well in advance, if you have a specific date in mind. 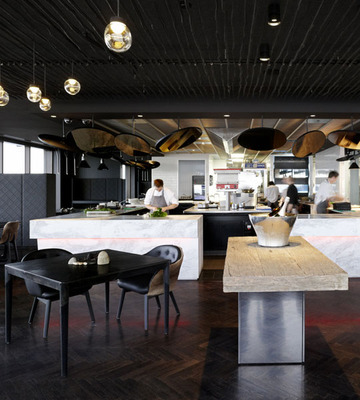 At Vue De Monde, it's all about the experience. You are greeted at the bottom floor by an extremely courteous hostess, who directs you to the elevator which whisks you up to the top floor in the blink of an eye. Attentive waiting staff cater to your every whim and desire (within reason, of course! ); from the taking and stowing of your coat to ensuring your glass is always topped up. The view from such a rarified height takes your breath away, even at night. It is quite simply a magnificent setting from which to enjoy such a unique dining experience. The fabulously stocked wine room (through which you are escorted on your way to the restaurant) has only the very best vintages from around the world, and each wine is expertly selected to complement every course of the meal. And speaking of which, the food is everything you'd expect from such a place, and then a whole lot more. No menus at Vue De Monde, the waiting staff simply establish your approximate price range and any dietary requirements, and then bring forth culinary delights and wonders, the likes of which have to be seen (and tasted) to believe, in the form of a degustation. Ingredients such as ox tongue, radishes, venison, smoked eel, eggs (in ways you've never had before), fennel, caviar, wild garlic and much much more, crafted into small but delectable servings so incredible as to become works of comestible art. And even though the servings are small, they keep coming and coming, and after eating and drinking such incredible fare for more than three hours you leave feeling fully satiated to say the very least. Despite the hefty price, and this is an understatement, this is something you must experience for yourself, even if it's just once. Dinner at Vue De Monde is a once in a lifetime experience. Why? Stunning is the best word to describe Vue De Monde, one of Melbourne's, and indeed Australia’s finest and most exclusive restaurants.